Hardrock 100: Here She Comes! There are so many things that I love about coaching. For starters, I love the opportunity to get to know and work with inspiring and motivated people every day who have a high standard of personal excellence, and who want to learn more and challenge themselves to achieve more. I love working with different athletes, from ultra-runners to triathletes - novices to world champions. I also love how so many of those athletes challenge me (often without knowing it) to be better and be truly worthy of their trust. Every day I embrace my responsibility to find more meaningful ways to be a positive influence on both their athletic development and their lives as human beings. Perhaps the most enjoyable of all though, is having the opportunity to work so closely with someone (and for a long enough period of time), that you can almost anticipate what they're thinking - how they're feeling, seeing deep inside of them to know what really makes them tick, knowing just what they may need to be their best. To be able to watch them grow, evolve and thrive. What hopefully develops with hard work, careful nurturing (and a little good fortune) is a mutual deep caring, trust and respect...a lifelong friendship that comes only from the true partnership that is a great coach/athlete relationship. That's exactly what has happened with the incomparable Debbie Livingston. 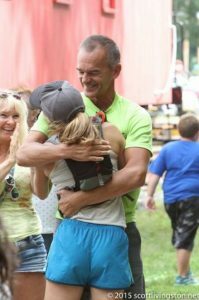 Meeting Debbie with a big hug and smiles, just after she crossed the finish line of a 3-Day Stage Race, The Emerald Necklace. I've coached Debbie for 7 or 8 years, I think. 🙂 Honestly, I've lost count - the years have just flown by. And they've been amazing. Funny...I was thinking about it and wanting to write this piece, so I texted her this morning and asked her when we started working together. "2010," she said. She remembered because it was the year after her daughter, Dahlia, was born. So why write about this today? Debbie is in Silverton, Colorado, with her family (husband Scott, son Sheppard, and the aformentioned Dahlia), going through final preparations for her first Hardrock 100 Endurance Run. Hardrock Hundred starts Friday morning, July 14th, at 6 am MST. It needs no introduction for anyone who even remotely follows trail or ultra-running. Simply put, it's one of the most difficult to run (and to get into!) ultramarathon trail runs on the planet and among the most prestigious just to finish. With 33,050 feet of climbing and 33,050 feet of descending for a total elevation change of 66,100 feet, AND with an average elevation of 11,186 feet (low point 7,680 feet and high point 14,048 feet), this ultra-running monster sure isn't for the weak or faint of heart. Hardrock has been a #bucketlist race for Deb for as long as I can remember. She's had an incredibly challenging time just getting into the race! Each year over the last few, we'd talk about her race schedule and always had to consider that this might be the year she'd get in. This year she's one of 145 runners who will start and one of only 22 women. 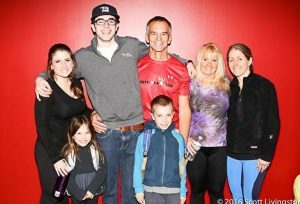 Debbie's husband Scott wrote up a beautifully detailed blog post preview as a lead-in to this year's race. In that post, he outlines a brief history of Debbie's failed attempts to gain entry (the lesson: never stop trying! ), along with all of the assorted fun they've had preparing for this unique race journey. To read that post (which I highly recommend), go HERE. 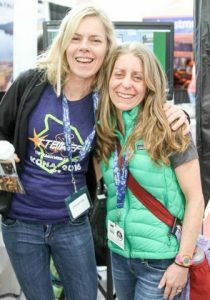 The real purpose of me writing this today isn't just to throw a huge shout-out and congrats to Debbie for having achieved this incredible feat of just GETTING TO the start line of Hardrock 100. (That's no easy feat. A great many ultra-runners end up toeing the line of their goal events nursing some kind of injury - having been unable to complete the training required and also survive to get to the startline 100% healthy). No, I want to do more than that. I'd like to share with you a few things about Debbie that I've learned coaching her. What is it that makes Debbie unique and allowed her to have such enduring success? I was going back through some of my old coaching notes and emails with Debbie and reminded myself that in the fall of 2012, we were fearful that Debbie might have a labral tear in her hip. As it turned out that wasn't the case. 🙂 The point of that story is, while Debbie's had many more victories than defeats over the course of her career as an ultra-runner, there have been some challenging periods. Like so many athletes, she's had to overcome her fair share of difficulty just to get to this point. Every time we faced one of those difficulties, we did it together (as a team along with her family). We re-evaluated what we were doing and how we were doing it. We tried to find a better way, together. Debbie really has been at the cutting edge of so many of the things I've introduced to my coached athletes. She's always willing to try new things and has become a master of so many (yoga, kettlebell training, vegan nutrition, to name just a few) because of her boundless desire to grow both athletically and personally. Both of them are 100% willing to be accountable for every single thing they do in training. They keep great training diaries, are always timely in how they communicate with me, and they leave no stone (details) unturned when it comes to their daily training and preparation. They're detailed oriented in every way. Both value their health ABOVE their fitness, meaning they would never exchange doing something that isn't smart for their health for a fitness "boost." They deeply value what it means to "move well" and approach their training holistically. What results is that they both possess a near-perfect balance between mobility/flexibility and stability/strength; one reason why they've remained durable for so many years. Both embrace a quality over quantity training approach which is based on a "movement-quality-first" mentality. Rare in ironman and ultra-running circles, it means they have more time and energy for family and work responsibilities. And less risk of burn-out over the course of many years of training and racing. Both love to learn and actively participate in learning every day. They're always the first to 1. be accountable to something new that I introduce, or 2. attend a class or clinic that I host, or 3. show up in a room full of students with a "beginner's mindset." They are incredibly humble. Both are mentally strong. In fact, they are the two most mentally tough athletes I have ever worked with. And I don't just mean on the race course. Yes, they are gritty and as tough as they come on the race course! More than that, by mentally strong I mean they willingly take days off and rest when they need it (do you think of the willingness to rest as a 'strength'?). They do the work without whining or bragging, they don't make excuses or miss training sessions needlessly, they own every result they get whether it's what they wanted or not, and they always put their family first and hold themselves to the highest standard, before anyone else. 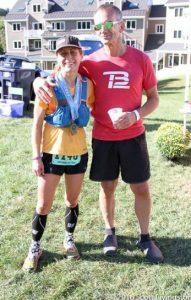 Debbie and I at last year's Vermont 50 ultra-run and mountain bike. A big group with my son AJ and his girlfriend Liz, and Terry, Deb, Dahlia and Shep...but we're missing Scott (per usual), he's always behind the camera! Debbie and I have gone on to host many camps and clinics together. Our families have grown close. We've built a lasting friendship that I know will far outlive our coach/athlete relationship. I'm honored to not only coach her, but to know her and call her a friend. I'm privileged to play a small role in this amazing life (running) journey she is on! I'd like to wish that wonderful "beauty and beast from the East" and her crew, the very best of luck as she toes the line this Friday and knocks one more trail "monster" off of her #bucketlist! You are going to do great. Join today to receive all updates in your inbox, for free! Boston Marathon Race Week: Old Habits Die Hard! Want To Be More Injury Resistant? Don’t Waste Your Time With This Dumb Exercise. Would You Like To Improve Your Running Technique?